Project partners Tina Comes and Bartel Van de Walle presented iTRACK poject at Annual Conference of the Dutch Coalition for Humanitarian Innovation. The HUMLOG Institute, in the frame of iTRACK project dissemination activities, participated in Global Logistics Cluster (GLC) meetings which took place at different locations (Washington, DC, USA, Rome, Italy) in June and October 2018. 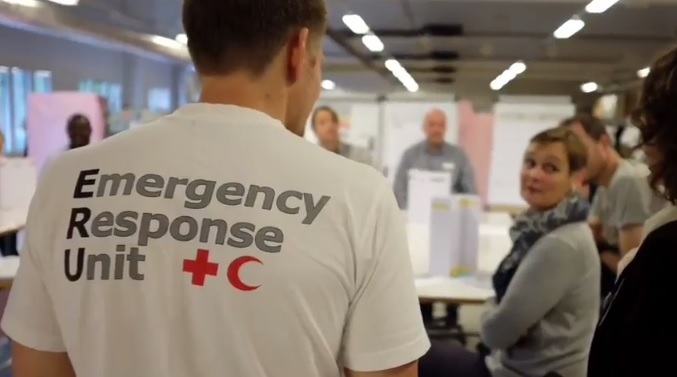 The Logistics Cluster provides coordination and information management to support operational decision-making and improve the predictability, timeliness and efficiency of the humanitarian emergency response. Where necessary, the Logistics Cluster also facilitates access to common logistics services. Due to its expertise in the field of humanitarian logistics, the World Food Programme was chosen by the IASC as the lead agency for the Logistics Cluster . WFP hosts the Global Logistics Cluster support team in its headquarters in Rome. WFP also acts as a ‘provider of last resort’ offering common logistics services, when critical gaps hamper the humanitarian response. Click here for a visual overview of the Logistics Cluster and here for 2018 highlights. Project partner Bjørn Erik Munkvold from UiA attended the FFI (Norwegian Defence Research Establishment) Seminar on the 19th of October 2018 and gave an oral presentation - "How can ny thechnology redefine the practice of crisis management. Project partner Sofia Tsekeridoupresented the project at the AIDEX Brussels 2018 Security Workshops on the 14th of November 2018. Nadia Saad Noori, Mehdi Ben Lazreg and Ahmed Abdeltawab Abdelgawad Salem Aboughonim from UiA gave an oral presentation at the CAIR- UiA Workshop for Oslo police collaboration. The workshop took place at Grimstad, Norway. Tipe of audience were policy makers around 30 people. 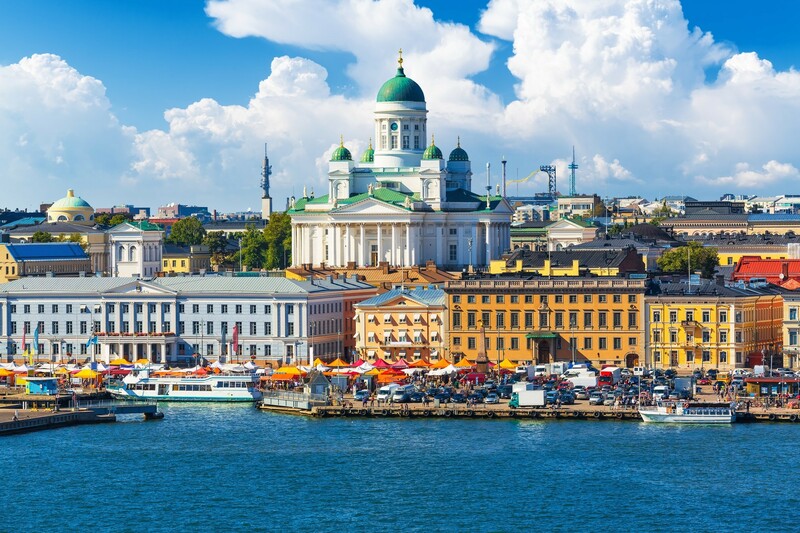 iTRACK project partner Boyan Yuan from NORCE submitted a paper tp CVPR 2019 workshop proceedings. The paper title is: "Real-time mobile surveillance using panomorph lens and deep neural network model"
Trilateral Research blog - ICT solutions for humanitarian missions: can new technologies understand different cultural contexts? 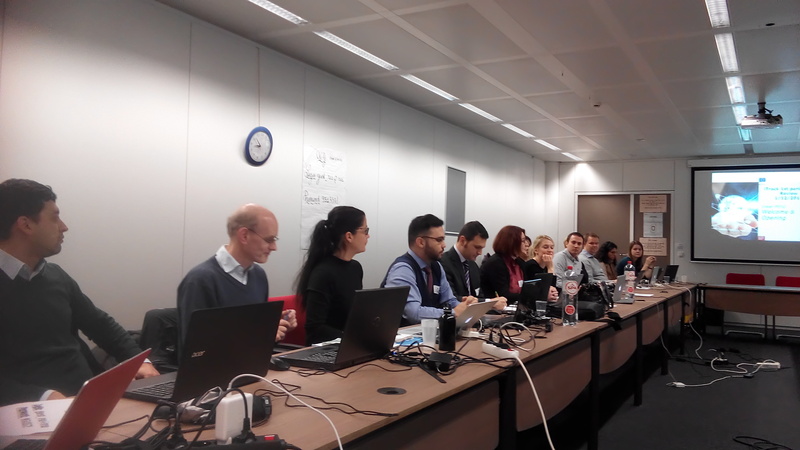 iTRACK project partners Olivia Ianelli and Julia Muraszkiewicz from Trilateral Research, published a blog based on the D3.2 deliverable on the TRI website. 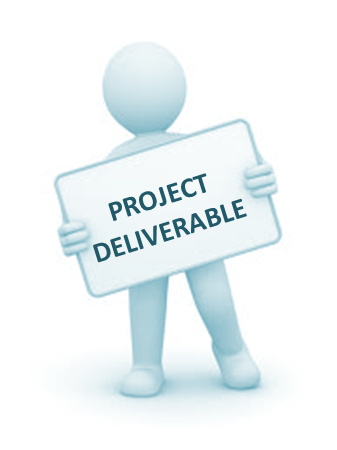 Deliverable 3.2 is called "Socio-curtural considerations for future development and it undertakes an analysis of the social and cultural implications of the use of the iTRACK tool and of each of its components namely: StaffSense, DSE and QR, on board sensing and threat detection and the use of multiple components. The conference theme was (Re-)Shaping Boundaries in Crisis and Crisis Response. This conference presentations ranged from the intentions and practices of government control in humanitarian response, international law and the humanitarian principles, how people organize themselves in the face of humanitarian crisis, what it means to foster a local response, how to be upward and downward accountable in practice, and discussions on the rapid transformation of technology in humanitarian action. One of the primary foci within the talks presented was the many open questions regarding the importance of humanitarian principles and the effectiveness of the humanitarian response, particularly in light of the recent calls at the World Humanitarian Summit for localisation and greater ties to development activities. Another was how to be locally accountable in a globally funded/driven world. A third was challenging and trying to provide critical and practical tools for rethinking the role of technology, and more specifically ICT technologies, in humanitarian response. Another was trying to determine lessons learned (and how to encourage learning, not just training) in humanitarian history/practice. There were also a set of panels on gender, but they conflicted with others I attended. iTRACK project partner Katrina Petersen attended the World Conference on Humanitarian Studies and presented the latest developments of iTRACK project. iTARCK partner, Olivia Iannelli (Trilateral Reseaach) will attend an ODI event on Disaster risk reduction in fragile and conflict affected contexts, 16:00-17:30 BST, 7 June, 2018. She will be joined by Dr Thomas Helfen (BMZ), Amjad Abbashar (UN Office for Disaster Risk Reduction), Dr Ayesha Siddiqi (Royal Holloway, University of London) and Rina Meutia (GFDRR, World Bank) for an open and frank discussion on why DRR policy, programming and financing has yet to be sufficiently applied to conflict and fragile contexts. Dr Sara Pantuliano (ODI) will chair. 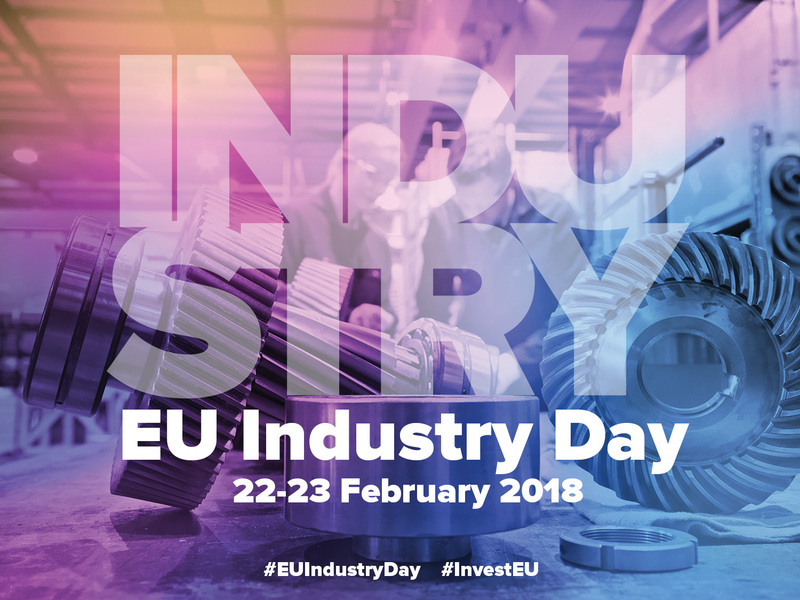 iTRACK Project attended the EU Industry Day that took place in Brussels - Covent Garden between 22-23 February 2018. Following the launch of the innovation prize of the European Innovation Council on 'Affordable High-Tech for Humanitarian Aid' (the 'Prize'), the European Commission's Directorate-General for Research and Innovation (DG RTD) and Directorate-General for European Civil Protection and Humanitarian Aid Operations (DG ECHO) organised a roundtable on High Tech for Humanitarian Aid. It brought together around 60 representatives of the humanitarian sector, industry, research and scientific communities and other interested stakeholders. The roundtable discussion focused on the identification of humanitarian needs that could be addressed through the frugal application of advanced technologies. iTRACK partner - Trilateral Research (UK) published a news article about the project on their official website. 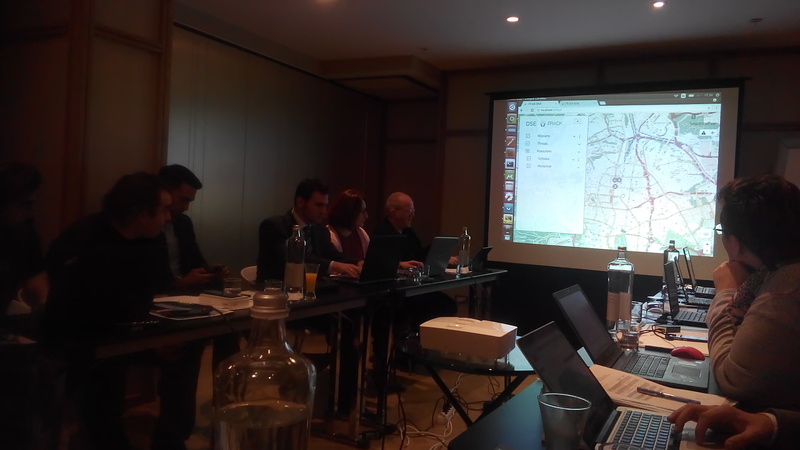 On December 1st the project had its first technical Review at REA premises in Brussels. This technical meeting was dedicated to finalizing the first phase of component development and the integration plan. Partners presented demos of all iTRACK components, ranging from key-cloak for secure messaging by Teleplan to the on-board tracking components by Teknova. On the 11th of July 2017, Heide Lukosch, developer of the iTRACK Board Game and researcher at TU Delft gave an interview and presented the project at the Dutch national news. iTRACK partner Hlekiwe Kachali from Hanken organised a workshop on Humanitarian logistics in conflict zones. The workshop aimed at alumni from Hanken Svenska Handelshögskolan. The Finish Red Cross decided to pick up the iTRACK Board Game, designed by iTRACK partner TUD, for their internal trainings for the volunteers and staff on standby. iTRACK project has been presented at the ISAGA 2017 conference by Yan Wang from the Delft University of Technology (TUD). On the second day of the event project partners from TUD (Yan Vang and Simon Tiemersma) preseted the iTRACK Board Game during the dedicated workshop. The 14th International Conference on Information Systems for Crisis Response and Management (ISCRAM 2017) took place at Albi, Occitanie Pyrénées-Méditerranée, France 21-24 of May 2017. The conference aims at exploring all dimensions of Information System domains to improve and contribute to Crisis and Disaster Management. Each article presented during the ISCRAM conference must cover both “Information Systems” and “Crisis and Disaster Management” research. iTRACK project has been represented at the Production and Operations Management Society (POMS) 28th Annual Conference which took place at Hyatt Regency Bellevue Seattle, Washington, USA between 5th -8th of May 2017. The Spring School involves both technical (information related) and social fields It targets a mixed public and aim at mobilizing the mixed competences & backgrounds from Spring School attendants & contributors in order to promote collaborative aspects. 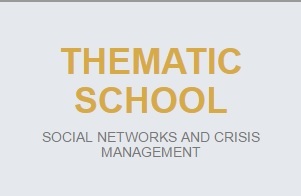 The thematic school is supported by the CNRS and the ISCRAM association. iTRACK project has been highlighted in Spring edition of the Crisis Team newsletter from Trilateral Research Ltd. The new project achievement is here! Architecture and Design Specifications deliverable, has been successfully submitted to the EC. Project presentation has been given to different organizations in Japan in the frame of visit by Norwegian Minister of Trade, Industry and Fisheries, Ms. Monica Mæland to Japan (23-26 January 2017) and within the delegation accompanying it. Yan Wang (TUD) attended the 9th Service Operations Management Forum and gave an oral presentation about the project to a scientific community. Kenny Meesters, Yan Wang (TUD) gave an oral presentation about the project to around 30 representatives from the scientific community. The event took place on the 6th of January 2017 at the Institute of Disaster Prevention, Beijing, China. Project presentation has been given by Teknova AS in the frame of networking activities in Norway: representatives from East Agder and West Agder Counties, SINTEF and different industries in Norway. 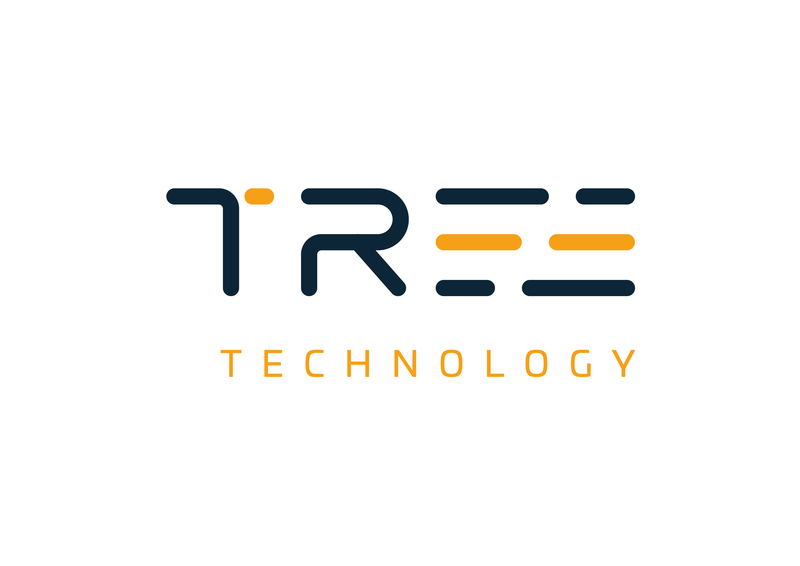 iTRACK partner Gerardo Glorioso (TREE) gave a presentation at the IDI Week in Treelogic central office, which took place during the IDI Week 2016, in Asturias, Spain on the 21st of November 2016.
iTrack project has been presented by Kenny Meesters and Yan Wang (TUD) at the national institute for earth physics at Bucharest, Romania. 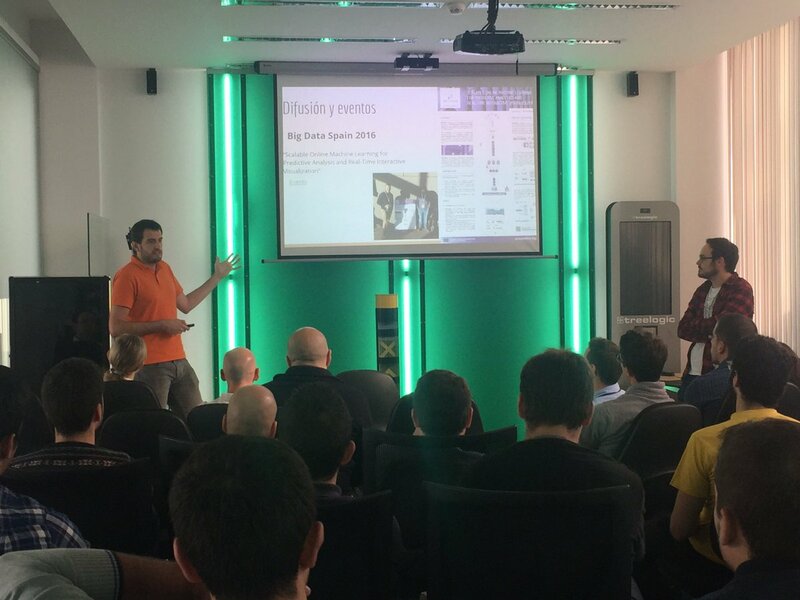 The presentation reached around 40 representatives from scientific community. 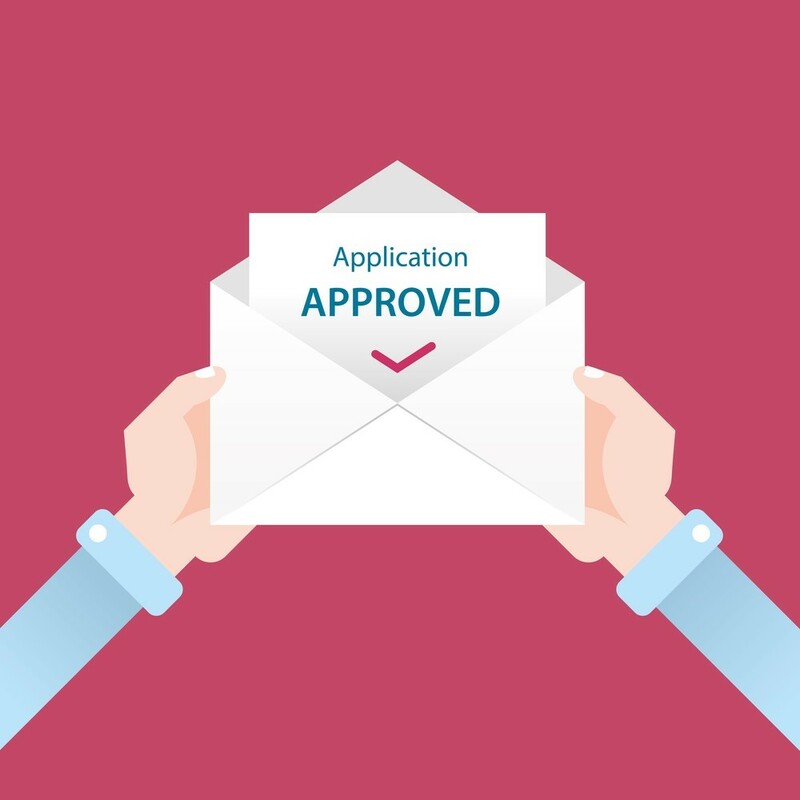 After several months of discussing and updating our application for approval of the iTRACK research by TUDelft’s ethical committee, we finally got the approval. As informed earlier, all research activities of all partners had been included in the last version of the proposal and the project’s risk analysis/self assessment. 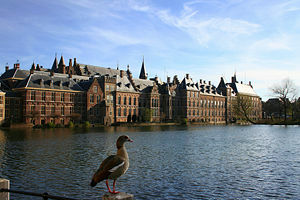 iTRACK project has been announced in the Trilateral Research Crisis Team newsletter. 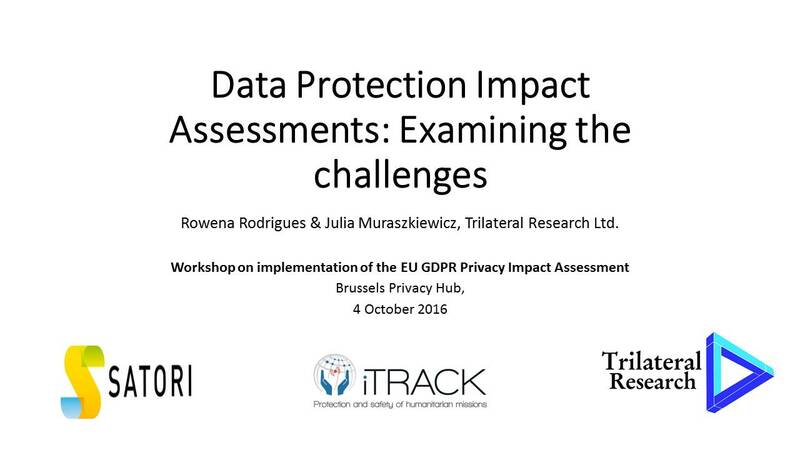 On 4 October 2016, as part of the GDPR Workshop series, the Brussels Privacy Hub hosted a workshop on implementation of the EU GDPR and Privacy Impact Assessment. Trilateral delivered a presentation which explored the methodology for an Ethics and Privacy Impact Assessment used in iTRACK. The event was attended by a wide range of stakeholders (around 25) from the humanitarian community, academia, private sector and the technology industry. 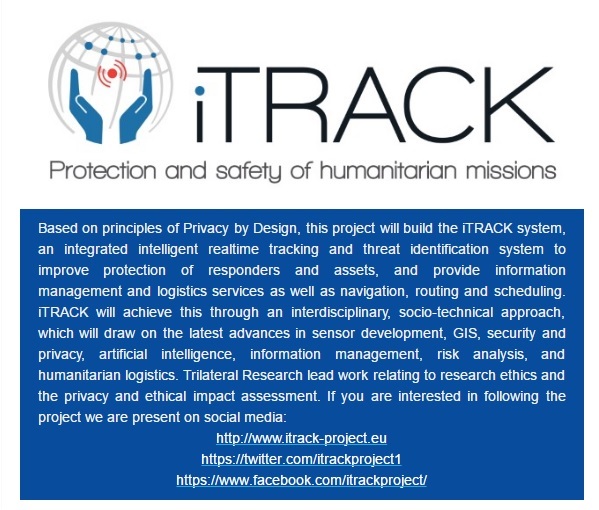 The European research project iTRACK was successfully launched in May 2016. The project brings together academics, innovators and end users to build the next generation intelligent tracking platform to provide better protection for civilian humanitarian missions. The iTRACK approach combines technology development with process and policy innovation to address real-world practices of humanitarian aid workers. The ISCRAM conference aims at exploring all dimensions of Information System domain to improve and contribute to Crisis and Disaster Management. The scope is by far incredibly wide, which makes one of the main attractive features of ISCRAM conference: “Information System” includes social, psychological, organizational, technological (and many others) aspects, while “Crisis and Disaster Management” refers to all kind of events that affects significantly human kind, from natural disasters to terrorist attacks via all types of accidents. Each and every article presented during ISCRAM conference must have one “Information System” component and one “Crisis and Disaster Management” component. 48TH ISAGA CONFERENCE ON SIMULATION GAMES FOR SUSTAINABLE CITIES AND SMART INFRASTRUCTURES.